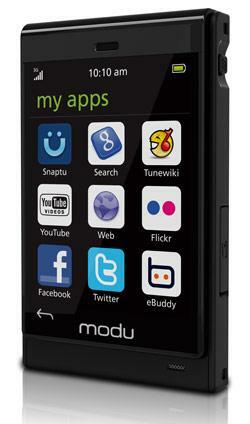 “modu” is a modular phone, which operates on Qualcomm’s Brew operating system and offers applications such as YouTube, Google Search, Twitter, Facebook, Flickr, TuneWiki, eBuddy, Snaptu etc. 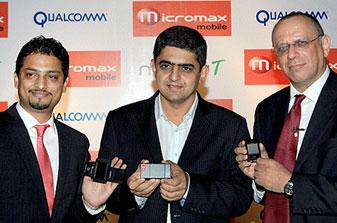 The Micromax modu T comes with two “fy” devices, jackets, which when connected, add new features to the phone. The “camerafy” jacket converts the phone into a camera with a 5 mega pixel cam and LED flash. Alternatively, you can also “sportfy” your modu T phone and turn it into your exercise companion.The handset will be available in the market from Oct 22. Mr Vikas Jain, business director, Micromax said “We are excited to work with modu, and bring this unique phone to the Indian audience with the Micromax touch. 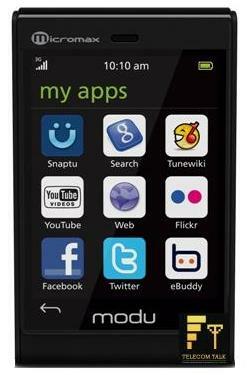 The modu T phone, co-branded and customized with Micromax gives consumer this modular mobile experience. He further adds, “The ‘fy’ devices provide an enhanced ecosystem, with multiple new functions added to the phone to enable users the freedom to choose, to change and to express themselves. Initially we will provide 2 ‘fy’ devices that make the phone multi functional and we are working with modu to introduce more ‘fy’ devices in the near future.